With all the scandals going on, small talk should be exciting at South Korean parties this winter. One thing South Koreans can’t complain about this winter is a lack of conversation topics. Four high-profile scandals have been the talk of end-of-year parties for students and office workers. When Korean politicians decide to run for office, they know they will face allegations, often fueled by opposition attacks. Revealing news discrediting the ruling party or president is a tactic often used by the opposition in Korea as elsewhere. After a period of relative calm for the two years following her election, President Park Geun-hye, whom some suggest is already a lame duck, is now facing two scandals simultaneously. In October, a National Assembly audit revealed that Park had appointed star fitness trainer Yoon Jeon-choo to a director level position at the Blue House, Korea’s presidential office. For many countries, that may not seem like a big deal, but it certainly is in South Korea. Public servants in the country have to go through gruesome examinations with an 87:1 competition rate to enjoy rather modest promotions, and need to work hard for years before they can reach director-level positions. As such, appointing a fitness trainer to a director position has caused some to question Yoon’s credentials, leading to allegations of nepotism, which were denied by the Blue House. More recently, a scandal known as “Memogate” has hit the president. 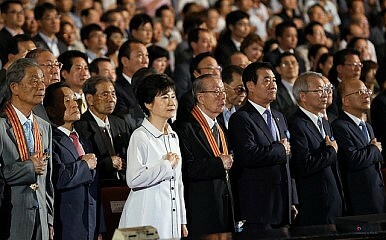 The scandal involved allegations that Park’s brother and a former aide were fighting for political power. Sensitive information from Park’s office was leaked, prompting questions as to whether there are power struggles going on at the Blue House and potentially tarnishing her credibility. Politicians, both from the opposition and Park’s own party, have asked whether it is acceptable for the president to be so secretive or to be working with an entourage that seems to prone to infighting. Another scandal, known as the “nut-rage scandal” involved Heather Cho (Korean: Cho Hyun-ah), former Senior Vice-President of Korean Air, whose outburst on Korean Air flight 86 from JFK Airport to Incheon Airport on December 5, has caught international attention. In the flight, Cho, who claimed she had been drinking wine before boarding, got upset at the flight attendant for serving macadamia nuts in an unopened bag. Cho yelled at the flight attendant, saying the nuts should have been served in a bowl. She then ordered the chief flight attendant off the plane, causing the plane to taxi back to the terminal so the flight attendant could get off. The scandal was revealed three days later, and has been at the center of many conversations in Korea. Macadamia nuts sales rose dramatically in Korea after news of Cho’s outburst shot the nut, which had hitherto only accounted for 5% of nut sales in South Korea, into the spotlight. The scandal reflects South Korean dissatisfaction with the behavior of heirs to Korean conglomerates known as chaebols, as Cho herself is the daughter of the owner of Korean Air. Cho is being investigated for violating airline safety regulations. Even foreigners living in Korea have not been spared from scandals. Enes Kaya is a Turkish expat who is known for his appearances on the Korean talk show Abnormal Summit (also known as Non-Summit). The talk show features foreign panelists debating cultural and social issues, and Kaya was known for his very conservative views. Though married with a child, Kaya is facing allegations from a woman claiming to have been romantically involved with the entertainer. She has given interviews and provided evidence of their involvement, and demanded that Kaya apologize. For his part, the TV star has cancelled his scheduled media appearances. Journalists flocked to his house for several days, seeking an interview with his wife. What shocked public opinion most was that Kaya’s alleged behavior contradicted the conservative, almost puritanical views he used to share on the program. Finally, an expatriate teacher got into a fight at a bar in the morning hours on November 30, severely injuring a Korean man. The Korean man later died. A group of expat teachers have set up a fund to help the teacher get legal representation, as he apparently lacks the funds to pay for counsel. Some expatriate teachers in South Korea worry about how they will be represented in the press following this incident. Western teachers in Korea have been vilified in the past, particularly after a scandal where several expatriate teachers flaunted their sexual encounters on an expat website and following the arrest in 2007 of expatriate teacher Christopher Paul Neil. Neil, who had lived in Korea, was charged with and convicted of pedophilia in Thailand. So, plenty to keep tongues wagging. Some, though, will be hoping that next year will be slightly less eventful for South Korea and its citizens.